What is a Wedding Entertainment Director®? “Since the beginning of wedding celebrations, music and entertainment has undoubtedly played a major role in creating fun-filled, memorable moments. Bands were the only option for musical entertainment until Mobile Disc Jockeys came on the scene in the early 1970’s. But at the time, most DJs delivered the same service as Bands…they just played music. In an effort to provide more value to their wedding clients while creating more successfully entertaining receptions, some Disc Jockeys began serving as the Master of Ceremonies. Soon, many DJs began promising to offer the same level and quality of services, with little to no training as MCs, for ‘half the price.’ The generally accepted idea was that being a DJ was easy and fun and just about anyone could do it with very little time, effort, or money invested. This overall negative branding in the public’s perception caused some DJs, who were striving to deliver the very best quality in service and performance for their wedding clients, to create a new identity for themselves. Because their services had expanded well beyond just playing music and/or making announcements as the Master of Ceremonies, they recognized a valid need to create a new name for their wedding entertainment services. 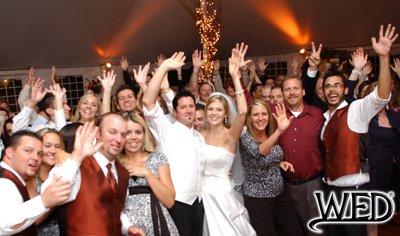 As a result, in early 2001, the new title of Wedding Entertainment Director® was developed. In an effort to ensure that every Wedding Entertainment Director® will provide each of these services to a measurable, professional caliber, the Wedding Entertainment Directors Guild® was formed. The WED Guild® utilizes a rigorous application process to verify that each and every member is a proven professional with a minimum of 5 years experience in wedding entertainment. If they have not yet reached that milestone, they must show that they have provided entertainment for a minimum of 200 wedding receptions. To see just how strenuous and thorough the rest of this application process is, feel free to visit the application page.